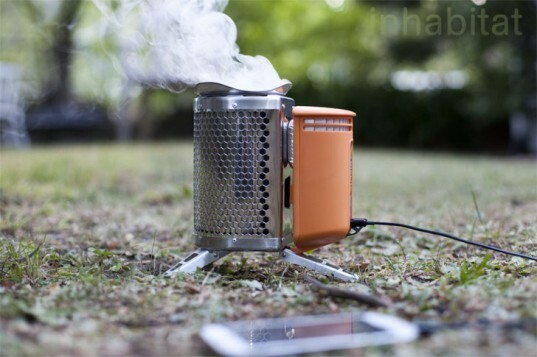 "Cook dinner and charge electronics anywhere with just a handful of kindling." That's the promise made by BioLite, maker of the BioLite Campstove, which runs on small twigs and converts the fire's thermal energy into electricity that can be used to charge portable electronics. This week, Inhabitat took the BioLite stove for a test drive to see how it performs, along with the BioLite Campstove Grill, and the results were mostly positive. The stove is easy to use, and as advertised, it does provide enough of an energy boost to enable you to make a couple calls when you're off the grid. For starters, the BioLite Campstove is remarkably easy to use. I’ve used several types of gas and wood-burning stoves before, and the BioLite is about as user-friendly as they come. After attaching the orange power module to the main chamber, you fill it with tinder and light it. Then, by pressing the ignition button on the power module, you activate a fan, which stokes the fire. The fan has two settings — low and high — and once the fire gets going, you can set it to high and fill the chamber with thicker twigs.When the stove is set to ‘high’ it burns through fuel pretty quickly, and I found that I had to refuel a couple of times, but it wasn’t too much of a hassle. Once the fire gets hot enough, a bar of light above the USB port turns green and you can hook up your phone (or anything else with a USB hookup) and it will begin charging. In addition to the fan, the orange power module contains a thermoelectric element, which converts heat to energy. Power output varies based on how hot the fire is, so if you’re slow-cooking some rice, for example, you probably won’t be able to add much life to your phone’s battery. In the two days that I’ve had the stove, I’ve used it to boil water and I’ve also added the grill attachment to cook a meal. The stove was quite efficient when boiling water; it took about 10 minutes to boil about a half-gallon of water, and in that time I was able to add 2 percentage points to my cellphone battery. That, of course, isn’t enough juice to surf the web and chat on the phone for hours. But if you leave the fire burning a while longer, you can easily charge it up enough to make an emergency call or two. Next, I hooked up the grill attachment and cooked up some veggies, a sausage, and a veggie burger. The grill is very easy to attach to the stove; it has two small legs that support it, and there is an opening that enables you to add fuel to the fire without interrupting the grilling process. Cooking on a wood-burning stove is a little different than using a traditional grill — for one thing, it tends to produce more smoke, and it leaves your food a bit blacker than charcoal would. But on the whole, I found the grill to be very easy to use, and it produced great results. And in the course of my grilling, which took about an hour total, I was able to add ten percentage points to my cellphone battery. The BioLite Campstove is marketed as a backpacking stove, and it would be great for backpacking because it doesn’t require you to bring any fuel (provided that you’re hiking in a place with plenty of wood). And, as the company points out, using a renewable resource (wood) is preferable to burning gas. But at just a little over 2 lbs it’s a little on the heavy side for many backpackers. It’s also a bit bigger than many campstoves (when packed down, it’s about the size of a 1-liter Nalgene bottle), which makes cooking easier, but it might be a bit too bulky to bring on an extended backpacking trip. However, the stove could have more applications than just camping. In the event of a power outage or natural disaster, the stove would come in handy, both as a power source for communication devices, and also as a way to boil water and cook food without having to worry about running out of gas. All photos by Mark Andrew Boyer for Inhabitat. 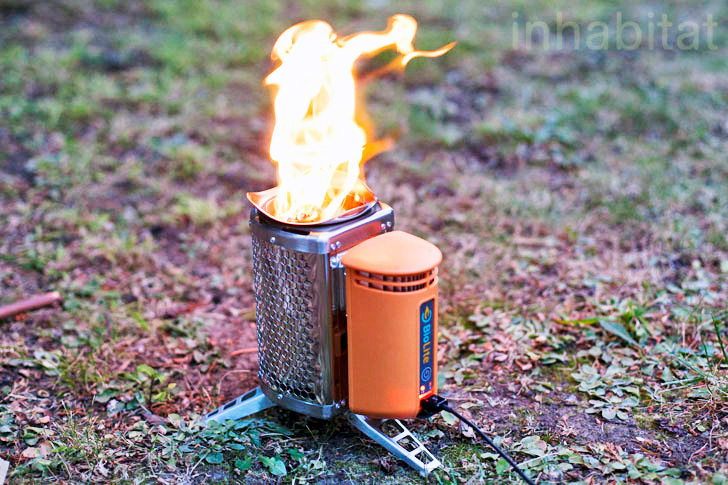 To view more photos of the BioLite Campstove, visit Inhabitat’s Flickr set. 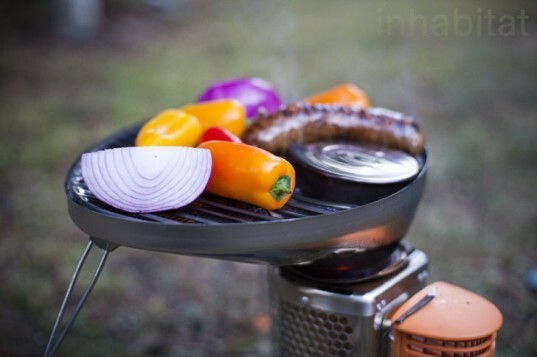 For starters, the BioLite Campstove is remarkably easy to use. After attaching the orange power module to the main chamber, you fill it with tinder and light it. The fan has two settings -- low and high -- and once the fire gets going, you can set it to high and fill the chamber with thicker twigs. When the stove is set to 'high' it burns through fuel pretty quickly, and I found that I had to refuel a couple of times, but it wasn't too much of a hassle. Once the fire gets hot enough, a bar of light above the USB port turns green and you can hook up your phone (or anything else with a USB hookup) and it will begin charging. In addition to the fan, the orange power module contains a thermoelectric element, which converts heat to energy. Power output varies based on how hot the fire is, so if you're slow-cooking some rice, for example, you probably won't be able to add much life to your phone's battery. In the two days that I've had the stove, I've used it to boil water and I've also added the grill attachment to cook a meal. The grill is very easy to attach to the stove; it has two small legs that support it, and there is an opening that enables you to add fuel to the fire without interrupting the grilling process. Cooking on a wood-burning stove is a little different than using a traditional grill -- for one thing, it tends to produce more smoke, and it leaves your food a bit blacker than charcoal would. On the whole, I found the grill to be very easy to use, and it produced great results. The stove was quite efficient when boiling water; it took about 10 minutes to boil about a half-gallon of water, and in that time I was able to add 2 percentage points to my cellphone battery. That, of course, isn't enough juice to surf the web and chat on the phone for hours. But if you leave the fire burning a while longer, you can easily charge it up enough to make an emergency call or two. In the course of my grilling, which took about an hour total, I was able to add ten percentage points to my cellphone battery. The BioLite Campstove is marketed as a backpacking stove, and it would be great for backpacking because it doesn't require you to bring any fuel (provided that you're hiking in a place with plenty of wood).